The Tilly Aston Heritage Collection is owned by Vision Australia Foundation, an organisation that has operated as a service provider for blind and vision impaired people since 1895. 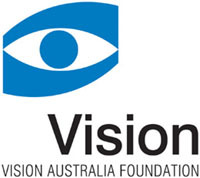 The collection's namesake, Tilly Aston, co founded the Association for the Advancement of the Blind (now Vision Australia Foundation), at the age of 21 and successfully obtained voting rights, transport concessions and a pension for blind people in addition to free postage for Braille material. Many of these achievements were at the forefront of worldwide change. The heritage collection represents this amazing history through photographs, memorabilia, archives, artwork, trophies and audio visual material. The collection is constantly growing and aims to capture and record the recent history of Vision Australia. Thematic displays of objects and photographs from the heritage collection are available for viewing by prior appointment with Vision Australia's Curator. A travelling exhibition is also planned for 2005. Vision Australia is dedicated to promoting the need for increased accessibility for all in museums and provides advice and a broad range of services to further this goal. By appointment through the Curator. Heritage displays, wheelchair access, accessibility service provider and advisory body. The Tilly Aston Heritage Collection represents the history and achievements of vision impaired and blind people in Victoria over the last century, primarily focusing on the role of Vision Australia. Photographs are a particular strength and cover themes ranging from the development of Australia's first nursing homes for blind people to technological advancements in low vision assistance. Also included are personal effects owned by key identities involved in the struggle for improved rights for blind and vision impaired people and machinery and implements used by Australia's first Braille library (now the National Information and Library Service) to produce Braille and audio books. Other material of national significance includes sporting memorabilia associated with the world's first games of blind cricket (a Melbourne invention) and artworks commemorating individuals such as Louis Braille, whose invention of Braille revolutionised the availability of written material for blind people. Rectangular, open weave, beaded evening bag made from small, circular, milky white glass beads. 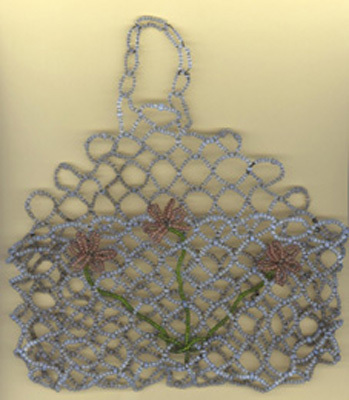 Three flowers made from green and pink glass beads have been attached to the front of the bag. Bag is H20 x L21 x W2cm. The evening bag was hand made by Tilly Aston. Tilly Aston was Australia's first blind teacher, co-founder of the Association for the Advancement of the Blind (now Vision Australia Foundation) and the Braille Library and the first blind woman to attend a university in Australia. Through her efforts services and conditions for blind people were greatly improved and were often at the forefront of world change. 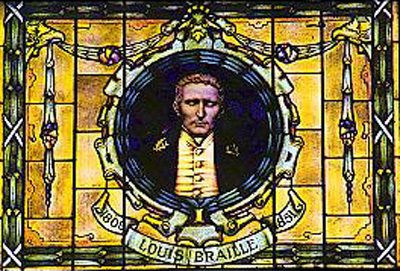 Framed and mounted stained glass window depicting front profile of a man identified as Louis Braille. Window is H152 x L110cm. The window was commissioned by the Association for the Advancement of the Blind (now Vision Australia Foundation) in 1929 using donations made by Braille readers and supporters of the organisation. The window forms a pair with a complimentary window depicting a memorial scroll to Louis Braille. Designed by Brooks Robinson and Co, a Melbourne-based stained glass firm, the windows were made to commemorate and celebrate the 120th anniversary of the birth of Louis Braille, a blind educator and the inventor of Braille. Originally situated in the Braille Library at South Yarra, the windows were moved to the new Vision Australia Library at Kooyong in 2001 and are now available for viewing by prior arrangement with Vision Australia's Curator. 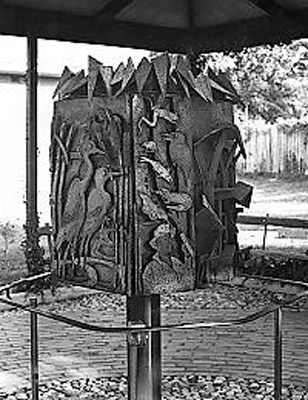 Heptagonal iron sculpture with seven panels arranged around a central metal pole. Sculpture is H170 x L80 x W80cm. This sculpture is designed to be tactile and accessible. It depicts the development of the Kooyong locality through seven themes identified as Harmony, Intrusion, Expansion, Industry, Density, Decay and Renewal. Each panel is built in relief and is identified by a Braille plaque located on a handrail surrounding the sculpture. The sculpture was created by Ian Bow who suffered a stroke just before commencing the work and lost his vision. After many months his sight returned, allowing him to complete the sculpture with new insight and understanding of the needs of blind people. The sculpture is displayed at Vision Australia Foundation and is available for viewing by prior arrangement with Vision Australia's Curator. 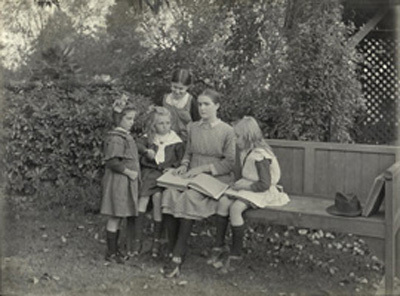 Photograph of woman sitting on park bench teaching four young girls Braille. Photograph is H15 x L20.5cm. This photograph shows Tilly Aston in her late teens/early twenties teaching children Braille in Melbourne, Victoria. Tilly Aston was Australia's first blind teacher, co-founder of the Association for the Advancement of the Blind (now Vision Australia Foundation) and the Braille Library and the first blind woman to attend a university in Australia. Through her efforts services and conditions for blind people were greatly improved and were often at the forefront of world change.